For the 4th time va-Q-tec participated in the “Würzburger Wirtschaftstage”. Dr. Joachim Kuhn (Co-founder and CEO) and Moritz von Wysiecki (Global Head of Marketing) gave everyone who was interested a tour “from printing house to vacuum insulation panel”. 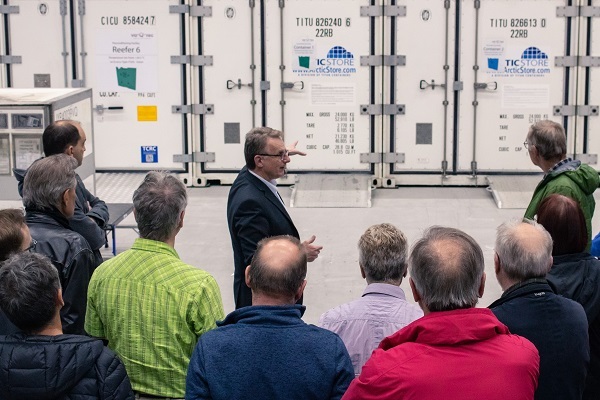 During the company presentation and the tour through the headquarters in Würzburg the visitors learned about the massive renovation work va-Q-tec did after purchasing the building from the former owner Stürtz. In addition the group gained detailed insights in va-Q-tec’s technology, its production process and why the company has been successful. The event was a part of the „Würzburger Wirtschaftstage“ which took place from the 1st to the 8th of April 2019, and promotes the information exchange between local institutions and business. The event arranged by Würzburg AG took place for the 13th time and has the goal to create a vivid dialogue between different parties in the region and give everybody an opportunity to learn about each other.